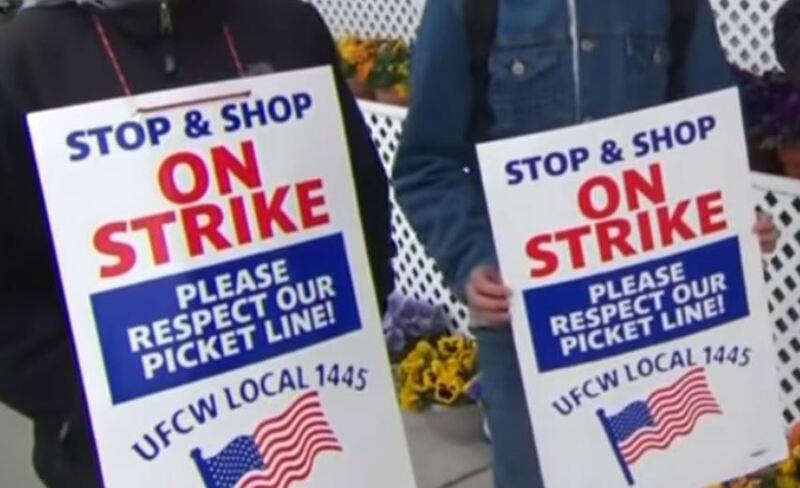 Thirty-one thousand workers at 240 Stop & Shop supermarkets across the northeastern of the United States remained on strike Saturday. They are protesting the company’s proposal to reduce their health care and pension benefits. Stop & Shop is a subsidiary of Ahold Delhaize, a Dutch retail company, which generates 60 percent of its sales from the United States. The strike, which is the largest in the history of the retail industry since 2003, puts at risk the supermarket’s turnaround strategy, according to Bloomberg. The United Food & Commercial Workers (UFCW) union has been engaged in contract negotiations with the company. The union rejected company’s proposal, which it called “drastic and unreasonable cuts” to take home pay and health care benefits. According to UFCW, Stop & Shop’s parent company made $2 billion in profits last year. Instead of recognizing the value and hard work of its employees, it is proposing a contract that would decrease their salary and significantly increase their health care costs. The company also wants to replace real customers service with more serve-yourself checkout machines. “The hard-working men and women at over 240 stores in Connecticut, Massachusetts, and Rhode Island are standing together to tell Stop & Shop that it is time to do the right thing. The men and women who make Stop & Shop a success have earned and deserve affordable health care, a good wage, and the ability to retire with dignity. They have earned and deserve a good job that allows them to do what they do best: provide the very best customer service for New England communities,” according to the union in a statement. On the other hand, the company expressed its disappointment with UFCW for ordering its members to walk out of their job.